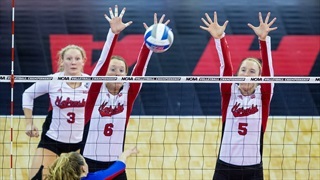 Nebraska volleyball has been powered by plenty of memorable in-state players over the years. In this exclusive excerpt from the new book Dream Like a Champion: Wins, Losses and Leadership the Nebraska Volleyball Way by John Cook with Brandon Vogel, Cook explains why he’s found volleyball matters in the state, the things that make Nebraskans topflight competitors and how the Huskers look for those same traits in players around the world. The chapter begins with Cook’s return to Lincoln following a successful stint building Wisconsin into a national power. My family and I arrived back in Lincoln in the spring of 1999. It certainly was not a common move, leaving a head-coaching job of a team on the brink of making the Final Four the previous two seasons to take an associate head-coaching job, even if it was where I started my college coaching career. Another way to put it: everyone knew what was up. The only logical reaction to the news of my hiring was that Terry Pettit was planning to retire and I was going to replace him and take the reins of the Nebraska program. We played coy about the succession plan throughout 1999. At his press conference a day after announcing that I was returning to Lincoln, Pettit refused to confirm that he was retiring. At my final press conference in Madison, the same day Nebraska was announcing my hire in Lincoln, I also did not take the bait, instead telling reporters I had Husker blood running through my veins. That part was true. During my first stint in Nebraska I had seen how much the sport of volleyball mattered to the people there. There is an uncommon bond between Nebraskans and the University of Nebraska, and I knew that level of support was capable of powering a program to great heights. Any coach would thrive on that support and I knew you could not find it just anywhere. Nebraska was special. Finding championship level volleyball talent as a college coach is not any different than it is in football, basketball, soccer, baseball, or any sport in that it’s largely a function of population. The more people a place has, the better the odds of producing top-level talent. Do people really love high school football in California, Florida, Ohio, and Texas? They sure do, and that matters when it comes to the type of players that come from those states. But they are also four of the most populous states in the country. That matters too. So how does Nebraska, a state of 1.8 million people, annually produce some of the best high school players and teams in the country? That is one of my favorite discussions and one I have thought about quite a bit. There have been weeks during my time at Nebraska when we have not been the only team from the state ranked number one in the polls. I will get to my office on Monday, the day the polls come out, and see not just Nebraska at the top of the AVCA poll for Division I, but also see Nebraska-Kearney in the top spot in Division II, Western Nebraska Community College leading the junior-college poll, Hastings College or Midland University at number one in the NAIA, and Papillion-LaVista South or another local high school topping the national prep rankings. Not only is there enough local volleyball talent to power the Husker program, there’s enough to power multiple programs in Nebraska. How does that happen? Pettit deserves a lot of credit for creating a winning culture at Nebraska and then sharing that expertise, which lifted the sport at all levels across the state. When he led Nebraska to the NCAA final in 1986, it was the first time a team from outside California or Hawaii had played for an NCAA title. Nebraska again was runner-up in 1989. Aaron Babcock A standing-room-only crowd at the Bob Devaney Sports Center watched Nebraska beat Penn State in the NCAA Tournament on Dec. 9, 2016. 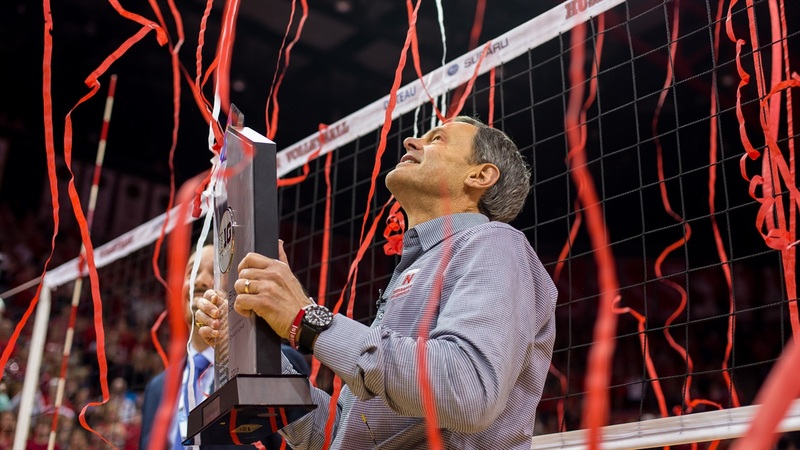 That success was instrumental in making volleyball matter in Nebraska, but Pettit did plenty of groundwork that went beyond just winning. He was always holding clinics throughout the state, spreading the sport. If high school coaches had questions, he was always available to answer them. We have had some true dynasties develop at the high school level in Nebraska. Jake Moore, the longtime coach at Lincoln Pius X, tallied 705 wins and seven state titles. John Peterson won 863 matches and fifteen state titles over thirty-seven years at Columbus Scotus. Steve Morgan won more than 900 matches and took home three state titles as the head coach at Ogallala. Sharon Zavala also topped 900 wins while claiming nine state championships at Grand Island Central Catholic. The level of volleyball instruction in Nebraska has been very high for a very long time. Of course, topflight instruction requires players to receive it, and Nebraska was better off in that regard than many people might think. The Nebraska School Activities Association began hosting a state tournament for high school girls’ volleyball in 1972, right around the time girls’ athletics were becoming more mainstream across the country. But the sport’s history here dates to earlier than that. During one of my early tours of the state as the Huskers’ new head coach, I stopped at Ole’s Big Game Steakhouse & Lounge in Paxton. It’s a Nebraska institution, stuffed with the exotic hunting trophies of its original proprietor. It’s the perfect place to drum up some support for the sport. While I was there shaking hands and making conversation, a group of women approached and wanted to talk about their experiences playing volleyball. They were all in their fifties or sixties but they told me about their experience playing nine-a-side volleyball in the 1940s and 1950s at a high school in the Sandhills. At the time I had no idea that the state’s history with the game stretched that far back, but, in combination with Nebraska’s success in the sport, I started to see why the sport seems to be in the DNA here. 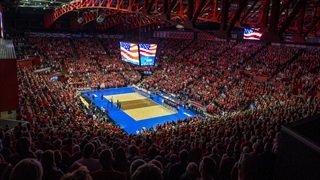 The biggest factor in making the Cornhusker State into a small-but-mighty volleyball factory, however, may be the people themselves. Nebraskans are a hard-working bunch. Nobody disputes that. In fact, it is mentioned so often that some people outside of the state might be tired of hearing it. But I tell everyone that the adage is true. Not everyone in Nebraska farms, but many people do and those that do not are around farmers all the time. They see the work ethic necessary for that job and it seems to permeate the state no matter the vocation. You try farming for a year: planting the crops, laying out huge amounts of money, hoping for just the right conditions, and then not knowing how things will turn out. It changes people, and, in my opinion, the change is for the better. My coaches and I have certainly found it to be true in the players we have recruited from Nebraska. In fact, we have started to identify recruits and offer scholarships based on some of what we have learned through being here since 2000. A few years ago I did a tally of all of my Husker rosters to that point. I found that about 40 percent of my players on any given team were from Nebraska. On my first Husker team in 2000 eight of the fourteen girls were Nebraska natives and we had just about the whole state covered. Anna Schrad and Sara Westling were from Lincoln. Pam Krejci and Lindsay Peterson were from small towns south of Lincoln. Laura Pilakowski, from Columbus, and Jenny Kropp, a Grand Island native, gave us two players from central Nebraska. That first team’s in-state footprint stretched all the way west into the panhandle, too. Angie Oxley was from Ogallala, and Kim Behrends was from Chappell, a little farther west. It is impossible to overstate how much value local players bring to our program. When recruiting in-state players, we know we are getting somebody whose dream it is to play at Nebraska. It is a really big deal for them to wear Husker red, it is a really big deal for their families, and it is a really big deal for their hometowns. All of those things add value. The towns those players come from may be small, but it is amazing to think about how many eyes our Nebraska players have on them, how many people have seen them succeed in high school and are rooting for them to do the same at Nebraska. I think it inspires those kids to work really hard. The best example of what I am talking about is Lindsay Peterson. She became our director of operations in 2006, a do-everything position that requires an intense attention to detail. I knew she would be great at it because she was a do-everything player for us between 1999 and 2002. Despite playing three different positions over the course of her career—setter, defensive specialist, and libero—Lindsay left Nebraska as the school’s career leader with 1,111 digs and she played 438 of 440 possible sets over four years. She was late for one practice, total. I still remember getting that call from Lindsay telling me she was going to be late. “Why are you going to be late?” I asked. “We’ve got this cow that’s trying to give birth and we can’t get the calf out,” Lindsay said. I laughed a little to myself. It was pretty hard for me to be upset about that, so I told her to get here when she could. Lindsay delivered the calf and eventually made it back for a portion of the practice. That tells you a lot about her level of commitment and her work ethic. As a coach, if you can find that in a recruit, you are doing pretty well. We tend to find it a lot in our homegrown players. We have learned over the years that if we are getting a girl from western Nebraska, we are probably getting a multisport athlete and often someone who was class president or valedictorian. She may have played an instrument in the band but probably has not played a ton of volleyball by modern-day standards. That’s the trade-off you make with small-school players: the club volleyball scene is not as easily accessible, just based on the distance between towns out west. But those athletes are usually involved in everything. We are getting great all-around athletes who are a little less polished from a volleyball perspective. In the past it was easier to take those athletes and get them ready to play. It is getting tougher now because there are so many more kids playing club volleyball. Club volleyball is so prevalent now that girls who play it get quite a bit farther ahead skill-wise. Aaron Babcock Kadie (6) and Amber (5) Rolfzen weren't just outstanding volleyball players, they were outstanding multisport athletes from Nebraska. Still, when asked by parents or athletes, I almost always tell volleyball players that they are better off playing multiple sports. I told my daughter, Lauren, that from a very early age. Playing more than one sport keeps young athletes’ bodies healthy by varying the movements they are making on a regular basis and avoiding overuse injuries. It also teaches them how to compete in different environments. Some of our best players over the years—Dani Busboom, Jordan Larson, Christina Houghtelling—were small town, multisport athletes, and almost all of them will tell you they got more nervous before high school track meets than they did for momentous matches at Nebraska. It is hard to replicate that experience. There is no other way to put it: we love multisport athletes. Eastern Nebraska, which includes the Lincoln and Omaha metro areas and serves as the center of our recruiting territory, offers us the best of both worlds. The club scene is flourishing there, so the players get plenty of volleyball, but most Nebraska girls are still playing multiple sports. Kadie Rolfzen and Amber Rolfzen were great basketball players and made it to state in track. Paige Hubl, a captain on our 2012 team, was a four-year starter in soccer and basketball at Lincoln Southeast High School. When we recruit out-of-state athletes, the majority of them have specialized in volleyball. They, of course, often become great college players too, but when you consider what it is about Nebraska that makes it so strong in volleyball, I think you have to consider the fact that the players here compete in other sports more often than the players in larger metropolitan areas. Their experience with teams and being a teammate extends beyond the volleyball court. That’s big. Eastern Nebraska is where we start our recruiting. It is vital to have an acute understanding of where your program resonates, so at the beginning of every recruiting cycle we start in the eastern part of the state. What can we get here? we ask ourselves. From there we move out in concentric circles. After our 50-mile ring, we have a 100-mile ring, and a 500-mile ring where we look for players. We have good connections in those areas and a 500-mile radius from Lincoln covers our entire state, plus it includes part of Texas, where we still have some success finding players thanks to our days in the Big 12 Conference, and the Chicagoland area, which is a recruiting hotbed that is fueling much of the Big 10’s recent success on the national stage. The ring is our model, but we are always open to finding the best players we can no matter where they may be. Cecilia Hall is an example. She won a national title with us as a senior in 2015 and she came all the way from Sweden to do it. During the summer camp season many European coaches come to the United States to spend weeks working camps. They will stop by our camp, maybe swing up to Mount Rushmore, and then head down to the University of Colorado’s camp. After that they will spend some time in the mountains, and then head out west to work even more camps. It is sort of a working vacation for them. In 2010 we had a coach from Sweden working our camp. “I see all these great athletes you have,” he said. “I have one and I think she’d fit in great.” Next thing I know I’m talking to Cici, as we all called her, in Linkoping, Sweden. She ended up picking us over Florida. Cici was a tremendous athlete. She had grown up with gymnastics and, at six-foot-three, could walk across the gym on her hands. She is also very intelligent, carrying a 3.5 grade-point average in biochemistry while she was here. But she was not a great player when she arrived because the competition in Sweden was not that high. We also struggled a bit initially to get Cici to understand the opportunity with which she had been provided. In Sweden higher education is free for Swedish residents, so a full-ride scholarship did not have the same meaning for her that it did for some of our girls. I constantly hammer home this point to our players. I tell our girls that athletes in baseball and track and swimming are getting only partial scholarships, while our players are all on full scholarships. That seems to work. We have kids who would cut off their right arm to get a scholarship. It took Cici a while to understand that, to develop her skills, and to find her place at Nebraska, but she worked hard at it. She was a great player by her senior season, ranking second on the team in blocks and hitting .300. A few months after Cici’s final season, I walked into my office to find a letter postmarked from Sweden. It was from Cici’s mom, Mona, a woman I had spoken with only once in Cici’s five years on campus. In the envelope was a $100,000 check with a note that simply read “Thank you.” I realized we were essentially being reimbursed for Cici’s education, both in the classroom and on the court. That was a first for me, but it was a very satisfying moment. It validates what we are doing at Nebraska. If we know that some of our greatest in-state recruiting successes are the result of the work ethic and passion for the program already existing in those recruits, how do we go about finding that something in every recruit we pursue, no matter where she is located? 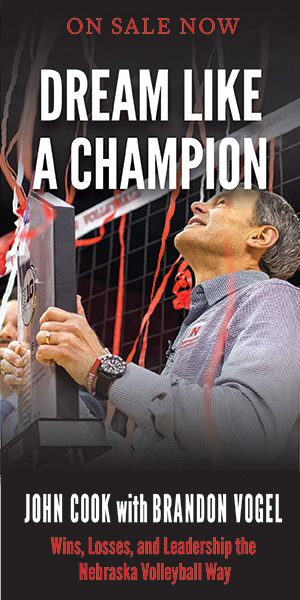 University of Nebraska Press "Dream Like a Champion: Wins, Losses and Leadership the Nebraska Volleyball Way" is on sale now. I have found over the years that about 60 percent of our athletes are daughters of teachers or coaches. In recruiting, that is a great cue for me. If a prospect has at least one parent who is a teacher or a coach, those kids bring something different to a team. They know it is not about them. It is about something bigger than themselves. If you grew up with a teacher or a coach, your mom or dad did not do that for the money. They did it because they care about kids. Athletes who grow up in that kind of environment have role models that make them understand what it takes to make a great team and a great teammate. I was fortunate enough to coach my daughter, Lauren, at Nebraska from 2010 to 2012. Every day after practice she would come up and thank me or one of the assistant coaches for coaching her that day. She didn’t do that because I asked her to do it. Lauren did it because she knew how much it meant to the staff members working their butts off every day. I think back to the example of the one practice for which Lindsay Peterson was late. At that moment she was in a stressful situation making the call to me, but she was thinking about the commitments she had made, both to her teammates and to her family. Nowhere in there was she thinking about herself. Her father, in addition to being a farmer, was also a volleyball coach. Lindsay learned that behavior somewhere. You can keep going down the list of former Nebraska greats and find the same thing, time after time. Sarah Pavan, a three-time conference Player of the Year and the 2006 National Player of the Year as a junior at Nebraska, grew up with a father who was a math teacher and coached volleyball and badminton in Canada. Christina Houghtelling, a two-time All-American and the 2005 National Player of the Year, has a dad who coached football in Cambridge, Nebraska. Jordan Larson, a member of the 2016 U.S. Olympic Team and the first player in Big 12 history to win Player of the Year and Defensive Player of the Year honors in the same season, had a mother and stepfather who coached and her father was a teacher. Jill McWilliams, the best team captain I ever coached and a member of my first team at Nebraska in 2000, grew up in Des Moines, Iowa, the daughter of a high school teacher. The 60 Percent Rule rarely steers us wrong at Nebraska. We believe in it enough to make it part of our recruiting strategy. 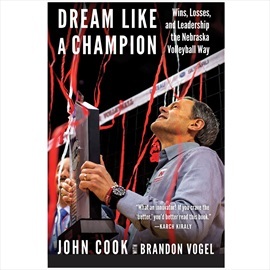 Reproduced from Dream Like a Champion: Wins, Losses, and Leadership the Nebraska Volleyball Way by John Cook with Brandon Vogel by permission of the University of Nebraska Press. Copyright 2017 by John Cook and Brandon Vogel.